Tough polypropylene construction lobby dustpan and broom, ideal for general maintenance during busy periods or in high traffic areas where it's not feasible to sweep the whole floor such as hotel lobbies, reception areas etc. 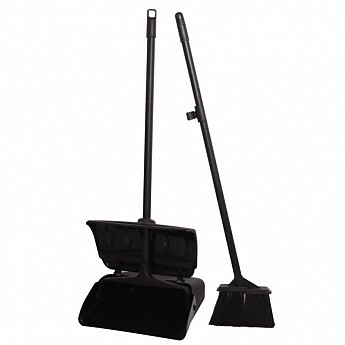 Long handle dustpan removes the need to bend down preventing obstructions and unnecessary back strain. Features wind break cover to prevent contents falling out. Broom features bracket to keep attached to the dustpan ensuring it doesn't fall over causing a trip hazard and allowing safe, tidy storage.